traditional Korean martial art of Kuk Sool Won. Kuk Sool Won™ - - - Strong, Smart, Good Martial Arts!!! The Lil’ Warriors class consists of ages 5-8 year old students. The Lil’ Warriors material is segmented into smaller learning modules to ensure they successfully learn the Kuk Sool Won™ curriculum. Classes are scheduled at 6PM. The Juniors classes are for students ages 9 through 12 years old. Classes are scheduled at 6PM. The Youth/Adult classes are attended by teens and adults, ages 13 and up. Lil’ Warrior and Junior students do not attend these classes. Classes are scheduled at 7PM. From time to time, other events and classes are scheduled such as the WKSA® Super Seminar, breaking and weapons workshops. 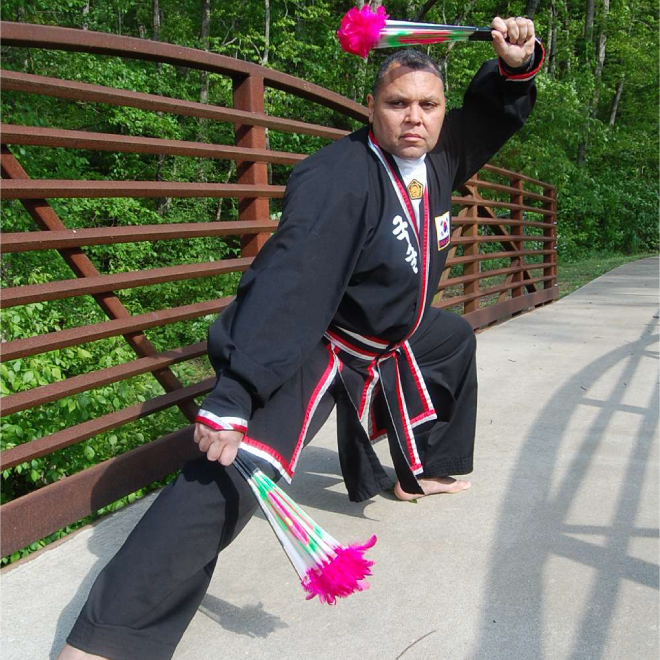 Over the years, Chief Instructor Kwan Jang Nim Eric Spivey has studied and trained in numerous martial arts such as Goju-Ryu, T'ai Chi, Wing Chung and Taekwondo, earning a 1st Dahn in Taekwondo. He discovered Kuk Sool Won during his search for a more balanced martial art. Training almost daily, Kwan Jang Nim Eric has trained, assisted and instructed at a number of Kuk Sool dojangs as he traveled with his work over the years. His hard work paid off, and he advanced through the ranks earning his 5th Dahn. He has established himself as a respected leader. His history coupled with his experience is manifested in both his patience and sincere concern for all the students he works with and teaches. Sa Bum Sa Nim Stephanie Spivey is the wife of Sa Bum Nim Eric Spivey. She has trained in both T'ai Chi and Taekwondo. She decided to study Kuk Sool Won™ after seeing how much Kwan Ja Nim Eric enjoyed the training. She took to the training with enthusiasm. Over the years, she has worked to increase her skills and knowledge through Kuk Sool Won™ seminars, workshops and competitions as much as her very busy schedule permitted. 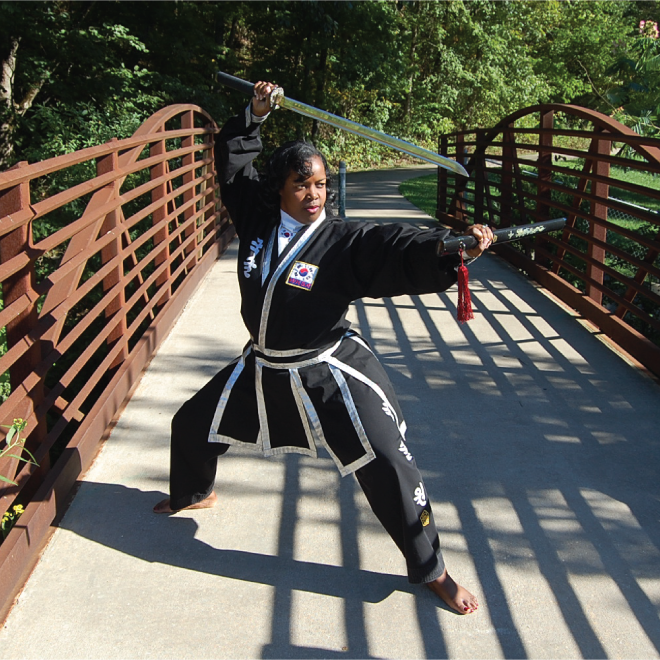 As Instructor, she conducts Orientation classes and Women's Self-Defense Workshops. She also assists Kwan Ja Nim Eric in teaching and training all students. 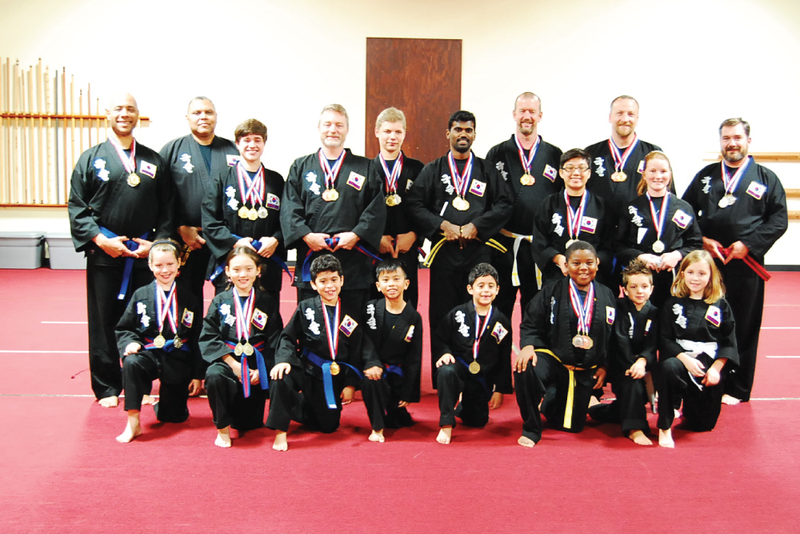 Adults older than 60 years have taken Kuk Sool Won™ and have received their black belt. Why is this so? Kuk Sool Won™ has many physical benefits from strengthening muscles, ligaments, and tendons, to improving circulation. Men, Women, even Parents: no matter the age, career or interests, will gain new confidence while improving your overall physical conditioning. Kuk Sool Won™ of Rogers will train you in techniques which will enhance your capability to effectively defend yourself. Subsequently, parents will enjoy an activity that they can participate in with their children while they grow mentally and physically. Have FUN while developing new life skills! Kuk Sool Won™ is a great way to: • Maintain fitness and flexibility • Stress reduction!!!!! • Learn valuable self-defense skills • Maintain a youthful appearance and attitude • Restore and maintain health, and boost your immune system. Moreover, it is: • A GREAT family activity • Self-defense and self-confidence • A chance to help each other learn new skills • Get closer by sharing a common activity • Develop friendships with other families who share your values • Encourage performance and help each other advance. Kuk Sool Won™ allows children and teenagers to: • Build self confidence and self discipline • Build sharing and social skills • Receive physical conditioning • Build character development • Have practical self-defense training • Be enriched with enhanced focus and concentration. My son and I have trained with sir and ma’am for over 5 years, and would highly recommend Kuk Sool Won of Rogers....As an encouragement to anyone thinking about joining and wondering if you can do it, we are a testimonial that you can. This is Amazing Place For Your Kids. They Are so Sweet and Wonderful People. We Are Really Enjoy There and My Son Love Them!!! Had our introductory lesson which took us through some of the common stances and strikes. The instructor was very patient and good at explaining the reason for the various positions along with demonstrating. My son and I both signed up! Loved it! I started Kuk Sool Won for my son, and I can say a few short weeks in....I am also on this journey for me. I absolutely love Kuk Sool Won. We looking forward to our classes each week. Sir and Ma’am are amazing instructors and the facility is perfect. Kuk Sool Won™ is a comprehensive martial arts system, derived from the rich and varied martial arts techniques and traditions that have arisen in Korea. Although its origins may be traced to antiquity, the present Kuk Sool Won™ system was formally devised by Grandmaster In Hyuk Suh in 1958, and was brought to America in 1974. As the founder of Kuk Sool Won™, In Hyuk Suh spent more than fifty years in single-minded practice and research in order to learn, master, and compile the more than 3,608 techniques that comprise Kuk Sool Won™. Kuk Sool Won™ is a systematic study of all of the traditional fighting arts, which together comprise the martial arts history of Korea. As a martial arts system, Kuk Sool Won™ is extremely well-organized It seeks to integrate and explore the entire spectrum of established Asian fighting arts and body conditioning techniques, as well as mental development and traditional weapons training.